Make natural nutrition-packed sauerkraut and pickled vegetables with this stoneware crock pot from Germany! Through the years, sauerkraut has been recognized as one of the healthiest foods, and was even used on sailing ships to protect sailors from scurvy. In just 4-8 weeks you can have delicious sauerkraut from all typed of vegetables like cabbages, pumpkins, cucumbers, carrots, beans, beets, celery, onions and peppers. Recently in the news, sauerkraut and pickled vegetables fermented the natural way with lactic acid fermentation are being credited with correcting bodily imbalances of intestinal flora, leading to problems including acid reflux for which doctors often prescribe harsh antibiotics. Natural lactic acid fermentation is one of the oldest and healthiest means of food preservation. It allows natural, beneficial bacteria to perform a fermentation process in which vegetables develop a pleasantly sour taste and remain rich in vitamins and minerals. Lactic acid fermentation is the only method of preservation that retains all the natural plant ingredients while improving the quality, taste and aroma. 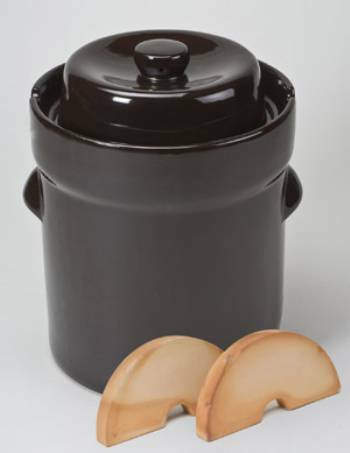 These beautifully crafted stoneware crock pots from Germany produce 5.0 Liters of pickled vegetables very simply. The use of ceramic weight stones eliminates mold while the clever water sealing system allows fermentation gasses to escape without allowing air to enter the crock pot. Simple instructions for use and recipes are included. What’s Special about Schmitt Crocks? Schmitt crocks are German quality stoneware made using liquid slurry poured clay. This process creates a stronger and lighter weight crock for easier handling. The Schmitt fermentation crock has a special cast gutter in the rim and includes a ceramic cover which fits into the gutter. It also comes with a 2-piece stone that is used to weigh down the vegetables and apply pressure during the fermenting process. The Schmitt Fermenting Crocks have a delightful dark brown finish.